Thanks to Patron support in November, December is a 12-update month, starting this week~ If you ordered a commission last month, you’ll be receiving that earlier in the month rather than later as well, in deference to holiday stuff :] Gonna be sending out those emails today to those parties. Additionally, a new wallpaper for the month went up for all $2+ Patrons. Alive-O. You forgot the “O”. …selling cockles and mussels alive, alive-o! That’s it. I guess I aged myself. Please don’t wake me, please don’t shake me, I’m only sleeeeeeeeeeping! I THINK I WAS RIGHT!! Poor little thigh-friend wants some water! They’re trying to reach out for it. Get it, thight-friend, get it!! Well he got it right up to, well, pretty much everywhere. Or a new friend for Mike! Some creatures do their best to look like rocks. I can just see it opening up and releasing grasp fronds when the tide is higher. It’s a Martian petroglyph. And it’s got boobies. Omg thank goodness thighfish is ok.
Infatuated Legfungus is our dear Mike’s symbiote! It is natural to be interested in the wellbeing of our friends’ symbiotes. It’s possible that Thigh-friend is influencing him and making him feel affection for it so he will bring it to the water it needs. There are microbes on Earth that do that so I don’t see why Thigh-friend couldn’t. Yeah, but it seems also to have rebuilt or replaced the injured bones/muscles that Mike got into his leg (at least, his injury there seemed pretty serious and he was worried about internal bleeding). To the point that Mike could once again stand on it. So it has to be doing something for Mike’s benifit. Mike would need water soon anyway and it’s not like he has anything to filter it trough. It might actually be safer for him to drink trough thighfriend. Because… because he’s cute? And flappy? And unhuman? There’s a certain safety in loving unhuman things, I think. amourous thighfriend should listen to v. Sentient living host friend , please refrain from flapping while hostfriend attempts descents lol. Snapping in to the rustle of reality, aren’t we? Got to start using “please” now that we’re friendly. Thighfish just wants to ~feel~ the water. Last panel. Leftmost “stone”. That’s not something of a “natural origin”. What’s that wall made out of :? Damp sand! Not the greatest climbing surface in the world. Truly, Der-shing, you are a master of sound effects. Such poignant “flaps”. Such moving “pafs”. Such delicate “thrips”. I cannot wait to hear the sounds of the Death Faucet of Mars. I am deeply in love with this page. People slowly sliding down panels will never stop being funny. So what’s that Mike’s wearing now? Is that his full suit minus rebreather and life support? Because if so, that’s gonna be fairly hard to swim in, even in 1/4 gravity. Particularly once it fills with water. I’m assuming that’s water. Or something water-ish. What if it’s not water? What if it’s FUNGUS POO? The funny thing is that I am quite ready to believe you and know that you are being literal. I… would not be at all surprised. 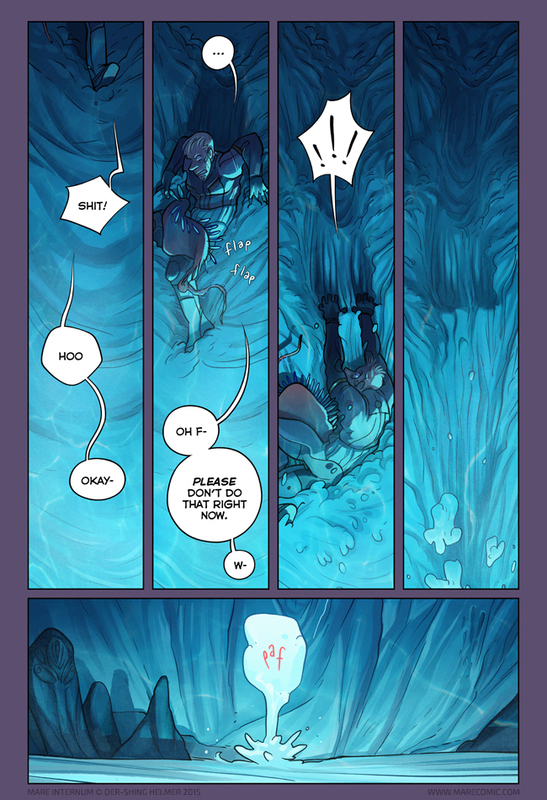 Whats with that rock on the last panel?? She back! And better than ever! ‘Paf’ doesn’t sound like a body hitting water to me. It sounds more like the sound a body would make hitting wet sand. I’d image him hitting the water with something more akin to a ‘sploosh’, ‘splash’, ‘boosh’, and the like. idk that’s just me. It’s not just him falling. He pulled a lot of sand loose from the wall. I’d imagine that the cloud of dust/sand could make a ‘paf’ noise when hitting liquid. I’d expect a noise more like “bloop”. “Paf” is not a sound water makes unless something hits it at very high speed, more than you could get at that distance, under that gravity. Apparently Thighfriend didn’t think Mike was getting to the water fast enough and wanted to help. And here I was thinking the helicopter-thighfriend prediction came true for a second. The inside of Mars is nougat. That’s what I was noticing. It doesn’t look like mud or dirt, but some kind of liquid rubber. Nougat is a good call. Thighfriend may also have also needed a lower altitude. Maybe the gasses are different the lower you go. I’m pretty sure amorous thighfish is now the main character of this comic. Sorry Mike, you got upstaged, now carry our new hero onto destiny! Paf is my favourite sound effect. Interesting how the wall appears to be some sort of blue clay. Well where exactly do you think Play-doh comes from? It doesn’t grow on tree, you know! Those petroglyphs in the last panel totally don’t look like the vaginasnake from Aliens: Prometheus. Nope nope nope.